The Federal City of Bonn is a statuary body. It is represented by its Mayor, Ashok Sridharan. The Federal City of Bonn always aims to ensure that information provided in this Internet presence is correct, complete and up-to-date. Nevertheless errors and ambiguities cannot be ruled out. The Federal City of Bonn therefore assumes no guarantee that the information provided is up-to-date, correct, complete, of a high quality and available at any time nor for the absence of other technical disruptions. The Federal City of Bonn is not liable for losses caused by the use of the information or data provided or through the use of incorrect and/or incomplete information or data, insofar as it is accused of intent or gross negligence. This exclusion does not apply to losses resulting from injury to life, physical harm or harm to health. The Federal City of Bonn expressly retains the right to amend, supplement, delete parts of the web pages or the entire content without a separate notification or to discontinue publication for a time or permanently. This website also contains correspondingly marked links or references to websites belonging to a third party. Responsibility for this external content lies solely with the provider, who provides the content. We merely facilitate access for the use of this content. The Federal City of Bonn is currently not aware of any unlawful or objectionable content on the pages of external providers accessed via a link. Nevertheless should the linked pages of external providers contain unlawful or objectionable content, then the City administration expressly distances itself from this content. The provider of the page to which the reference is made is solely responsible for illegal, incorrect or incomplete content and in particular losses, which arise from the use or non-use of information from a third party, not the person/party merely referring to the relevant publication via links. 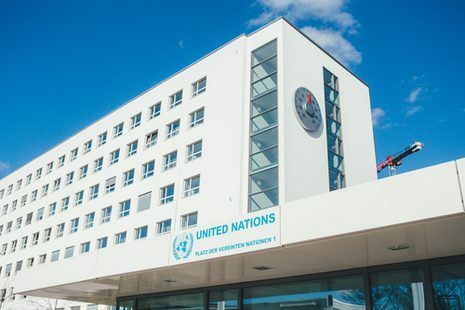 Bonn aiming for more sustainability. The organisers of COP23 in Bonn are aiming for high standards in environmental performance. All environmental impacts of this event will be analysed and wherever possible adverse environmental effects minimised. The benchmark being applied is the internationally recognised environmental verification scheme EMAS, which sets the bar particularly high for eco-friendly services. Unavoidable CO2 emissions such as those arising from travel to and from the venue must subsequently be offset. The 23rd United Nations Climate Change Conference (COP23) is being hosted in the most environmentally friendly sustainable way possible. The intention is to minimise greenhouse gas emissions. Unavoidable emissions are being offset through ambitious climate projects. The organisational set-up of the Bonn Climate Change Conference aims to set a new environmental standard for large-scale events. Because of this, the German Environment Ministry and the UN Climate Change Secretariat are striving to achieve certification under the particularly stringent Eco Management and Audit Scheme (EMAS). Under EMAS, all environmental impacts are analysed in order to minimise adverse effects where possible. Unavoidable carbon dioxide emissions, arising in particular from travel to and from the conference, will be offset. This is a joint project of the German Environment Ministry (BMUB) and the UN Climate Change Secretariat.